The birth of Tsukasa Taiko broke new ground in the Chicago taiko community, incubating the idea of independence. Before Tsukasa, community taiko was associated with Buddhist Temples as membership was offered exclusively to those within each respective temple. Tsukasa Taiko became the first private taiko group independent of these exclusive organizations. The inclusiveness attracted many students to Tsukasa Taiko including some of the current core members. And consequently, Yoshihashi became the first independent taiko drummer. Encouraged by his success, Yoshihashi’s colleagues began creating their own groups. Many of these groups are still active today. Yoshihashi was a catalyst for this trend and an important contributor to Chicago taiko culture. Tsukasa Taiko was founded in 1996 by Hide Yoshihashi with the help of Wakayagi Shiyu. Shiyu, a master of Japanese classical dance had founded her own taiko group Waka Daiko under her Wakayagi Ryu dance school. Yoshihashi later created Tsukasa Taiko 司太鼓, taking kanji from Shiyu’s name司友 and started to teach small weekly classes at the Wakayagi residence. He led community performances with his students, most notably at the Bon Odori Festival at Mitsuwa Marketplace when it was formerly known as Yaohan-. This summer festival became Tsukasa Taiko’s first annual event. Tsukasa Taiko is currently one of the largest and most active community taiko groups in the Chicagoland area. Despite being one of the younger organizations, Tsukasa has over 50 professional and community performances throughout the year. The last decade has seen Tsukasa become a strong pioneering force, leaving behind a legacy that changed and continues to change the standards of the community taiko group. Under this new structure, Yoshihashi was introduced into the scene as one of the first taiko players to be associated with professional music scenes . Yoshihashi performed at major venues, events and artistic projects representing Tsukasa Taiko, joined by Aoki’s two eldest children who were 4 & 7 at the time. Stages and events included the old HotHouse, Chicago Cultural Center, Chicago Jazz Festival, Chicago Blues Festival and Asian American Jazz Festival. These years reveal Tsukasa Taiko’s early involvement in professional settings. Tsukasa was also the frontman to bring children and youth to the large stage. The first generation of Tsukasa Taiko’s regular performers consisted of students from around age 4 to 16, who were all performing with Yoshihashi at these venues and events. Tatsu Aoki, founder and director of AIRMW became artistic director, as it was important that a working artist and musician with direct lineage to the classical Japanese arts would guide the group towards a new goal. Aoki was born into a traditional okiya household in Japan. He grew up playing taiko and shamisen (three-stringed Japanese lute) since age 4 as part of his cultural training and was part of a theatrical performing crew during his adolescence. Influenced by this unique background Aoki began nurturing the group with the distinct objective of maintaining the traditional aesthetic of the Japanese theatrical Arts. His creative direction and leadership was vital for the development of Tsukasa’s current professional and specific stage presence. Aoki’s guidance was also essential because Tsukasa’s affiliation with AIRMW meant it would now function as part of a non-profit arts organization. This status allowed more national and international connection with arts communities. Yoshihashi started to collaborate with Asian Improv aRts Midwest in 2001 for more strategic operation for a group geared towards arts and culture. The shift was a significant beginning for evolving of Tsukasa Taiko’s legacy. 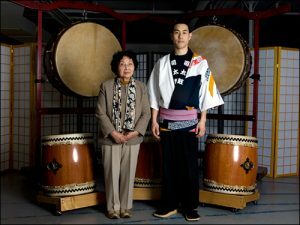 After Homma’s retirement in 2011 Tsukasa Taiko enlisted the help of Noriko Sugiyama who was a member of Ayutsubo Taiko in Shizuoka, Japan. Sugiyama represents a milestone for AIRMW and the Chicago taiko art scene. She is the first drummer to be working officially in Chicago with a VISA. Her involvement has been extensively to manage and expand the children’s classes at the main JASC dojo as well as Mitsuwa Marketplace, which has been Tsukasa’s second location for the last few years. Tsukasa has now over 60 members with almost 30 children. In 2004 Tsukasa moved and established its artist residency at the Japanese Service Committee of Chicago where they currently reside. Shortly after in 2006, Yoshihashi retired. Amy Homma took over Yoshihashi’s leadership and became the head instructor and performer for Tsukasa Taiko. Homma had been playing with Yoshihashi throughout Tsukasa’s earlier years. Aoki took this opportunity to create a full-time position for Homma. She became the first full-time, professional taiko player in Chicago. This was an important benchmark in Chicago’s Japanese American cultural scene as there was no full time performer in the traditional arts outside perhaps the martial arts. Homma’s position effectively distinguished Tsukasa Taiko as an organization fully committed to establishing the taiko player as a qualified, musical artist. Homma was the only multicultural, bilingual representative of the community arts. She studied under Aoki to cultivate her artistic career, and performed in many local, national, and international professional scenes. She was the first community leader to officially perform in Japan, Poland and travelled multiple times to San Francisco. The Gintenkai Unit’s role is to actualize the artistic goal in preserving, developing and passing on traditional concepts of Japanese art. Westernization and commercialization has created mass misinterpretation. Taiko music is often misrepresented as a form which values fast rhythmic patterns similar to those played on drum sets and drum lines. However, the aesthetic roots are found in theatrical concepts of kabuki and nichibu (Japanese classical dance). The concept of ma (the space between) is emphasized. Choreography is also important in presenting the movement of the body. These movements stem from classical Japanese dance, reinforcing the connection between music, dance and theatre. This important aesthetic value is specific only to Tsukasa Taiko, and is what predominantly distinguishes Tsukasa from other groups. Tsukasa also reincorporated geza music to the stage using shamisen and shinobue as regular components. The Gintenkai Unit focuses on compositions that Aoki grew up playing during the 1970s. The reincarnated pieces are are complex, refined arrangements that embody all the elements to preserve an authentic, Japanese aesthetic. Instead of a rhythm, melody and orchestration is valued and created. In 2006 Aoki formed the Gintenkai Performance Unit. This unit is responsible for high caliber shows that are of a more professional nature than the community recitals and performances which showcase multiple levels of adult and children. Gintenkai is taught by Aoki and its members are advanced youth and young adult players. Most have been with Tsukasa for over a decade, starting classes with Yoshihashi. Since Homma’s retirement the Gintenkai Unit has taken full responsibility and leadership for all performances. Sugiyama has been an active member of Gintenkai since her arrival in 2011. They have played at The International House at the University of Chicago, Logan Center for the Arts, Jay Pritzker Pavilion, Harris Theater, Steppenwolf Theater, Chicago Symphony Center, Museum of Contemporary Art Chicago and many more. Since 2010, Tsukasa Taiko has also participated in the annual McDonald’s Thanksgiving Day Parade with 3 million viewers. No community taiko group had ever performed in these large scale venues before Tsukasa Taiko appeared on stage. Tsukasa Taiko is distinguished as being the sole Japanese speaking taiko group. Tsukasa emphasizes the preservation of language as part of the cultural legacy. Gintenkai Leader Kiyomi Negi and Gintenkai Captain Kioto Aoki are bilingual, second generation Japanese Americans. Though not all members are of Japanese descent classes are taught in English and Japanese, stressing cultural etiquette in the Chicago setting. As part of the educational outreach Tsukasa also offers lectures, workshops and classes for public schools and universities studying the Japanese language in the Chicagoland and Midwest area. Tsukasa Taiko has many other milestone accomplishments. Tsukasa is currently the only community taiko group in Chicago with CD releases, recognizing the changing generations of Tsukasa’s history. The first CD was released in 2006 which highlighted Yoshihashi and a second was in produced in 2011 featuring Amy Homma and the Gintenkai Performance Unit. The most recent release in 2013 was an exclusive CD of Gintenkai Performance Unit. Tsukasa Taiko has actively participated in public events supporting the recovery from the 2011 Tohoku earthquake and tsunami disaster around Chicago. This year of 2015 included an event at the Richard J. Daley Center coupled with a photo exhibit chronicling the rebuilding process. Tsukasa Taiko has been a pioneer for visual presentation as well, introducing was the kai no kuchi musubi, a classic way to tie the happi obi to Chicago groups during Yoshihashi’s early experiences on the stage. Presently, Tsukasa’s performances require multiple costumes and costume changes. There are several variations of koikuchi (worn with and without harakake), happi, and hachimaki worn throughout a single show. Gintenkai members also wear traditional kimono and yukata. Additionally, Tsukasa is the only group which has implemented the hikinuki technique collaborating closely with Japanese classical dance school Fujima Ryu of Chicago. Taiko Legacy is important in truly portraying the national and international art legacy practice that Tsukasa Taiko works to preserve. International artist Grand Master Chizuru Kineya from Japan has been a part of Taiko Legacy for the last few years, as have Grandmaster Fujima Shunojo and Fujima Yoshinojo from Fujima Ryu of Chicago.Takane Umeya comes from Japan for the first time and Hyakkyou Fukuhara joins Tsukasa for a second time this year, and Melody Takata brings Gen Taiko from San Francisco. In addition to the aforementioned AACM members, Hamid Drake and Michael Zerang come back to form a dynamic trio with Gintenkai member Eigen Aoki. One of the most important performances of the year for Tsukasa Taiko is the annual Taiko Legacy performance, hosted consecutively for the last few years at the Museum of Contemporary Art Chicago. Taiko Legacy is the largest show hosted by a community taiko group in Chicago, and is now part of the permanent museum archive. The show is a presentation of the traditional taiko arts both as a preservation and advancement of musical culture in the modern world. In 2013, the Taiko Legacy event included an evening show called “Reduction” which showcased a much more quiet, experimental presentation aimed at musically mature audiences. Reduction will be presented again this year, as Reduction II with Taiko Legacy 11. 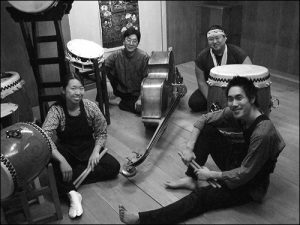 Tsukasa Taiko has a national and international presence and regularly collaborates with artists and musicians overseas. Hide Yoshihashi, Amy Homma, and Kioto Aoki of Gintenkai have travelled to Poland to play at the Malta International Theater Festival and Made in Chicago Festival. Tatsu Aoki is an active avant-garde, jazz bassist himself and uses Tsukasa Taiko for creative endeavors such as his Miyumi Project. Hence Tsukasa Taiko is able to collaborate with renowned AACM musicians in Chicago such as Mwata Bowden, Ed Wilkersen Jr., Dee Alexander, Coco Elysses and Douglas Ewart. Tsukasa Taiko shares a similar attitude with these artists who are committed to preserving creative, non-mainstream, musical integrity. Tsukasa’s sister group resides in San Francisco; Gen Taiko from Gen Ryu Arts led by Melody Takata. Aoki also formed the National Gintenkai Project, teaching advanced players from Gen Taiko the same Gintenkai pieces he teaches Tsukasa’s Gintenkai Unit. Throughout the year, members fly out to play in annual performances for each group. Over the last decade, Tsukasa has expanded the scope of what the community taiko group can do and served as a pioneer in community professionalism, maintenance and development. It is an aesthetic and journey that can only be provided by the direct lineage that Tsukasa Taiko possesses. Tsukasa Taiko aims to continue to use the cultural arts to deepen the Japanese and Japanese American Communities’ understanding of its heritage and cultural legacy. Yoshihashi started to collaborate with Asian Improv aRts Midwest in 2001 for more strategic operation for a group geared towards arts and culture. The shift was a significant beginning for evolving of Tsukasa Taiko’s legacy. Tatsu Aoki, founder and director of AIRMW became artistic director, as it was important that a working artist and musician with direct lineage to the classical Japanese arts would guide the group towards a new goal. Aoki was born into a traditional okiya household in Japan. He grew up playing taiko and shamisen (three-stringed Japanese lute) since age 4 as part of his cultural training and was part of a theatrical performing crew during his adolescence. Influenced by this unique background Aoki began nurturing the group with the distinct objective of maintaining the traditional aesthetic of the Japanese theatrical Arts. His creative direction and leadership was vital for the development of Tsukasa’s current professional and specific stage presence. Aoki’s guidance was also essential because Tsukasa’s affiliation with AIRMW meant it would now function as part of a non-profit arts organization. This status allowed more national and international connection with arts communities. The Gintenkai Unit’s role is to actualize the artistic goal in preserving, developing and passing on traditional concepts of Japanese art. Westernization and commercialization has created mass misinterpretation. Taiko music is often misrepresented as a form which values fast rhythmic patterns similar to those played on drum sets and drum lines. However, the aesthetic roots are found in theatrical concepts of kabuki and nichibu (Japanese classical dance). The concept of ma (the space between) is emphasized. Choreography is also important in presenting the movement of the body. These movements stem from classical Japanese dance, reinforcing the connection between music, dance and theatre. The Gintenkai Unit focuses on compositions that Aoki grew up playing during the 1970s. The reincarnated pieces are are complex, refined arrangements that embody all the elements to preserve an authentic, Japanese aesthetic. Instead of a rhythm, melody and orchestration is valued and created. This important aesthetic value is specific only to Tsukasa Taiko, and is what predominantly distinguishes Tsukasa from other groups. Tsukasa also reincorporated geza music to the stage using shamisen and shinobue as regular components.